Stephen joined the company in 2007 as a director and head of marketing. He is responsible for managing the company’s marketing and brand strategy and developing new business opportunities with private clients, charities and professional intermediaries. He sits on the Management Committee. Previously, he held a similar position at Merrill Lynch and also at the law firm Freshfields Bruckhaus Deringer where he was head of business development for the Financial Institutions Group. Prior to this, Stephen taught Classics at Charterhouse and Repton School. 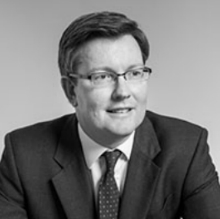 He graduated from Emmanuel College, Cambridge in 1992, has an MBA in Finance from Strathclyde Business School and is an Associate of the Chartered Institute for Securities and Investment (CISI).